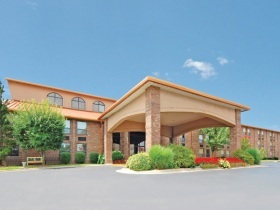 The Platinum Award-Winning Comfort Inn at Thousand Hills is one of premier hotels in Branson, MO with a balanced blend of business and leisure features. Whatever your reason for travel, the hotel's location is sure to please. Overlooking the Thousand Hills Golf Course, the “Comfort Inn” is surrounded by peaceful, beautiful scenery. The hotel offers more amenities than guests know what to do with including free hot breakfast, free WIFI, indoor pool & hot tub, game room, gift shop, and more. From fundamental business features to essential relaxation elements, the Comfort Inn at Thousand Hills provides the keys to an outstanding experience.